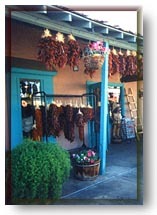 There are many hotels and motels in Scottsdale with something for every taste and price range. For more information and a complete list. 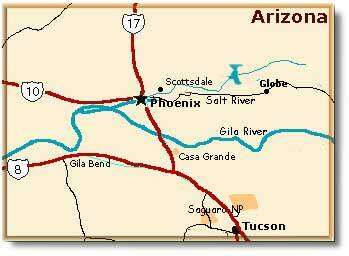 Scottsdale is located in central Arizona, just east of Phoenix, between Carefree and Tempe. It is known for its more than 100 art galleries, craft shops and golf courses. It is a popular retirement/tourist community featuring numerous cultural activities January through April. Year Jan. Feb. Mar Apr. May Jun. Jul. Aug. Sep Oct. Nov. Dec.
From 800 to1400 AD, the region of cuent-day Scottsdale was occupied and farmed by the Hohokam. More than 200 miles of canals were built to provide water to support their agricultural needs. It wasn't until 1888 that settlers began to permanently establish homesteads in the area. Army Champlain Winfield Scott and his wife were the first family to settle in the region to farm citrus, sweet potatoes and peanuts. In 1896, the first school house was opened and in 1897, J.L. Davis opened a general store with a post office. The beautiful year-round weather made the town of Scottsdale a prime location for resorts. The Ingleside Inn was completed in 1909 and was one of Scottsdale's first winter resorts; many others followed. Scottsdale continued to grow with the addition of Cavalliere's Blacksmith Shop in 1910 and a cotton gin in 1920. In 1951, with 2,000 residents, Scottsdale was incorporated as a city and the newly elected mayor, Malcolm White, gave the city its slogan "The West's Most Western Town." Sedona, Arizona: 119 miles north. Wickenburg, Arizona: 53 miles west. Prescott, Arizona: 94 miles north. Tucson, Arizona: 117 miles south. Montezuma's Castle National Monument: 85 miles north. Fort Verde State Historic Park: 83 miles north. Casa Grande National Monument: 47 miles south. Picacho Peak State Park: 73 miles south. Tonto National Monument: 60 miles east. Tonto National Forest: Adjoins the city. Cosanti Foundation: Headquarters/workshop of architect Paolo Soleri. 480-948-6145. Rawhide: An 1800s town recreated with stagecoaches, saloons and even a jail. 480-502-5600. Fleischer Museum: Impressionist paintings and sculpture.480-585-3108. Taliesin West: Frank Lloyd Wright's architectural school/studio. 480-860-8810. The Arboretum at Arizona State University: 5 miles east (Tempe). Boyce Thompson Southwest Arboretum: 58 miles east.